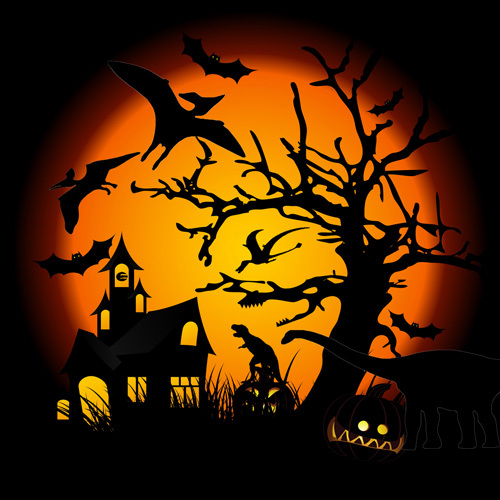 October 31st is “All Hallows Eve” a time for spooky goings on, pumpkin lanterns and trick or treats. From a palaeontologist’s perspective it always surprising when one considers the scary and frightening monsters that are conjured up from the imagination when the fossil record is full of evidence of strange, bizarre and monstrous animals that really existed. A psychologist friend waxes lyrical on our fear of dark places and something “lurking in the woods”. To our ancestors, forested areas harboured predators such as bears, wolves and things much worse, these were places to avoid and our primeval fear of dark, poorly lit, potentially dangerous places still persists in many of us today. Most mammals lack colour vision, unlike the birds and as most scientists agree, the Dinosauria. The widely accepted theory is that mammals evolved in the shadow of the dinosaurs who were mostly diurnal (active during the day). Our ancient mammalian ancestors, scurried about in the undergrowth or were nocturnal. This was a strategy for survival, being small and furry made you fair game for a large number of predators so it was best to hide during the day. As a result, most mammals have eyesight still suited to this way of life, we primates are an exception not the rule. To celebrate October 31st, we have created a little spooky Halloween picture of our own. Everything Dinosaur team members have hidden some prehistoric animals in the picture, as well as the Everything Dinosaur logo. Can you spot them all with your colour vision? Can you spot the prehistoric animals? The fossil record demonstrates the great variation in vertebrate forms that have evolved. There are a number of candidates for the title of “scary creature”. Of course there are the fearsome Theropod dinosaurs along with a huge number of other predators. Take the Gorgonopsids for example. Named after the terrible Gorgon of Greek myth, some of these Therapsid predators with their monstrous teeth and jaws were apex predators during the Permian. Not capable of chewing, these reptiles probably bit off chunks of flesh and swallowed them hole. There were also plenty of frightening mammals and birds around in prehistory, the aptly named “Terror Birds” or the mighty, nobbly-faced Uintatherium, a genus of huge, herbivorous mammal from the Eocene. The largest species of Triceratops currently recognised is called Triceratops horridus (horrible three-horned face). When the huge skull with its three horns was first studied, academics thought this was a dinosaur that would have looked horrible, but to us when viewing a reconstructed Triceratops skeleton we think it is rather beautiful. A Triceratops Skeleton – Horrible or Beautiful?